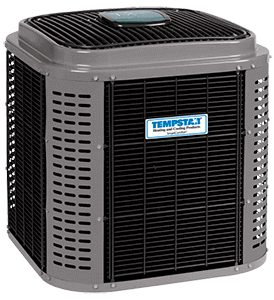 Tempstar QuietComfort Series Air Conditioners | A/C Repairs Inc. The QuietComfort TXA6 provides high efficiency performance, up to 16 SEER and 12.2 EER, combined with ultra quiet, as low as 69 decibles, performance. Tempstar QuietComfort Series air conditioners provide high efficiency cooling, quiet operation and lasting durability for the years of quiet in home comfort. Call 813-909-0809 and get a free, no obligation, quote on a QuietComfort air conditioner for your home. Need financing? Check out the Tempstar credit card as well possible rebates up to $800. Quiet, durable and designed to last, the QuietComfort® 16 Central Air Conditioner brings a cool relief to hot Florida summers. With a cooling capacity up to 5 tons and a SEER up to 16, summers will be no sweat. Even while working hard, the TSA6 remains super quiet (69 decibels). This QuietComfort air conditioner is Energy Star compliant plus it comes with a 5-Year No Hassle Replacement™ Limited Warranty and a 10-Year Parts Limited Warranty. Combine it with the Observer® communicating wall control for Wi-Fi® enabled remote access. The QuietComfort® 15 Central Air Conditioner has a cooling EER of 12.2 and a cooling capacity up to 5 tons. Built solid for quiet (74 decibles) operation and durability in all types of weather, this high efficiency durable air conditioner will provide years of cooling comfort even in the heat and humidity of Tampa Bay. It’s Energy Star rated with a SEER rating up to 15. This ensures your comfort won’t come at the expense of your budget. The TSA5 includes a 5-Year No Hassle Replacement™ Limited Warranty and a 10-Year Parts Limited Warranty.